The AES 137th International Convention is gearing up to take place October 9-12, 2014, at the Los Angeles Convention Center, located in the re-vitalized L.A. Live district. 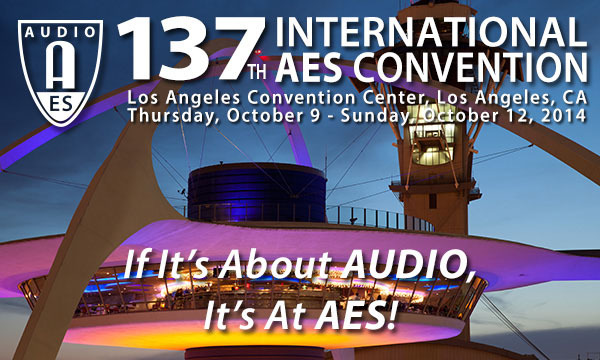 Returning to Los Angeles after nearly 12 years, the AES Convention will bring together the world’s largest gathering of audio professionals for four days of the best of what the industry has to offer. Attendees will be able to take advantage of opportunities to hear from top audio industry figures while also sharing in the latest research and technology information through informative papers, tutorials, workshops and special events. No matter what sector of the industry you are involved in — recording and production, broadcast and streaming, game audio, live sound, post-production, and more — AES137 will have something for everyone. Of special focus this year will be Networked Audio and its integration into our standard workflow, with particular attention to standards such as AES67, MADI, and other networking protocols that the AES has played a large part in shaping. From creating such standards, to maximizing playback potential of the final product, the Audio Engineering Society is the place to connect with the people and technologies on the leading edge of professional audio. As a recent addition to AES conventions, the popular Project Studio Expo (PSE) presented by Sound On Sound magazine, serves as a venue for focusing on some of the most timely and relevant areas of interest facing today’s personal and project studio users. These comprehensive presentations cover topics of importance for all engineers, producers and recording enthusiasts, without leaving the exhibits showcase area. This fourth edition of the PSE will feature two new and unique presentations: “The Five Most Common Project Studio Recording Mistakes,” presented by Mike Senior of Cambridge Music Technology; and “Project Studio Design,” with acclaimed studio designer John Storyk of the Walters-Storyk Design Group. Both programs will give personal insight into practical project studio issues, from initial design to avoiding common mistakes in workflow and technology. Visit the AES137 home page for future updates on registration, programs, and special events at http://www.aes.org/events/137/.